A Saturday night in Bradenton, Florida couldn't have been more perfect. Being near the beach on a chilly evening is the perfect excuse for a bonfire, add to that, Craig Morgan on the stage at Joyland, Mantaee County's largest honky tonk, and what you get is country music perfection. As soon as the first strains of every true blue country boy's favorite song, "International Harvester", wafted from the speakers, the crowd rushed out on the floor and to the front of the stage. For the next hour or so he would completely captivate the elbow to elbow, standing room only, audience with his powerful baritone voice. Before performing is number one hit song, "That's What I love about Sundays", Morgan said, "I like playing in the dirt, racing bikes, fishing, shootin' guns, and jumpin out of airplanes, I spent over ten years in the Army and I loved it!. Every chance I get, I give back. I just got back from Afghanistan. It was my tenth overseas tour and if there's any veterans here tonight, active or retired, thank you for all you do, and what you sacrifice. Because of men and women like you, I am able to do what I love; play music". Then he slowed it down even more with "Almost Home". The respect he has for God, his country, and his family is easy to see, and hear, in his music. Holding the attention of the boisterous crowd, he picked up the pace with "Little Bit Of Life" followed by his rendition of the old Steve Miller hit "Joker". Then he kicked it up another notch with AC/DC's "Back In Black", while taking the opportunity to introduce his band. Everyone was singing along as he got into one of the crowd favorites, "Redneck Yacht Club", before moving onto his newest single, "More Trucks Than Cars". I was happy to hear that his next song was one of my favorites, "I Got You". The next song was dedicated to his wife, Karen, "This Ole Boy", co-written with Rhett Akins, Dallas Davidson, and Ben Hayslip, also known as the Georgia Peach Pickers. He closed his show with "This Ain't Nothin', a song he says he loves to sing. As the band left the stage, the chants and foot stomping began and could be heard echoing down on the beach. Much to the delight of everyone within listening distance, Craig returned to the stage for one final song of the evening, "Let's have a Bonfire". Being an Army brat and former military spouse myself, there is one last thing I need to say. I want to give a heartfelt "HOOAH!" 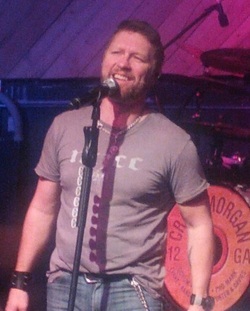 to Craig Morgan for being a supporter of the American military personnel and their families. In addition to a prolific country music career, he hosts the award-winning show “Craig Morgan: All Access Outdoors" and co-hosts "Field & Stream's Total Outdoors ManChallenge," both airing on Outdoor Channel.